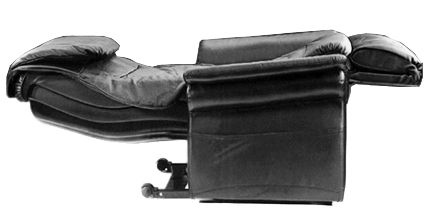 Extensive analysis of the traditional Shiatsu Massage enabled duplication of the delicate, complex movements of a professional Japanese massage therapist's technique in these massage chairs. you can set massage time from 1 to 30 minutes. rolling, tapping, kneading and simultaneous triple actions. - Inversion Reclining, up to 190 degrees reclining. Seat vibration and Armrest vibration. to make it as a regular recliner, when you sit in the chair, you will not feel the rollers on your back. for the seat, back, pillow, armrest, footrest. Shiatsu Massage uses three intricate movements: pressure is applied gently to an acupoint, it is held, and then is suddenly released. This massage technique is both relaxing and invigorating simultaneously. Massagenius used modern electronic technology to analyze the finger movement of a professional massage therapist in order to develop a way to duplicate it. Rolling massage helps to stretch the spine and relieve pressure on the discs. As two massage wheels roll up and down the spine, they also helps to stimulate spinal nerve roots and reduce muscular back pain. Two massage heads, as opposed to other units that offer more, are optimal for increasing blood circulation instead of cutting it off. Tapping massage helps to improve blood circulation, reducing muscle stiffness and enhancing movement of oxygen and nutrients throughout the body. Advanced Massagenius technologies present in all of our massage chairs enable you to select the strength of the 500 taps per minute as well as the area to be massaged.